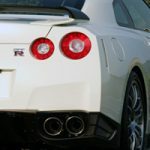 Abflug have released images of an aero kit that thhe Japanese firm hopes to offer to customers of Nissan’s highly regarded GT-R. The kit focuses on providing purely cosmetic extrerior upgrades, the engine remains untouched as does the interior (we pressume). There’s a new front lip spoiler, and complete side skirts as well as a new rear diffuser and rear wing. Finished largely in carbon fibre, the kit contrasts the white bodywork of the example shown in the photos below. For extra visual effect, the company have added a set of Enkei GTC01 to the car to finish it’s small makeover. Subtlety is the key up front. Looking at it you’d be hard pushed to tell the difference between this car and a standard GT-R. It’s when we get to the rear of the car that things start getting noticeable. For starters, mesh grills extend from the outside of the exhaust housings. Then you also notice the huge new diffuser with two tunnels either side of a mesh block. It’s not much but it gives the GT-R that extra bit of personality that some owners may feel that such a clinical car lacks.